Every industry needs a leader. A simple—yet profound—statement, it’s a driving force for everyone at Pillar To Post. With 23 years of experience under its belt, the home inspection company has helped nearly 3 million families move into homes over the years. But as the needs of the industry and customers continue to change, a good home inspection is no longer good enough. “We have to address the needs of the real estate professional and buyer or seller in a holistic way,” says Dan Steward, Pillar To Post’s current CEO. For Pillar To Post, doing so boils down to being deeply engaged with both sides of the equation and fully committed to acting as a trusted advisor to everyone the company serves. 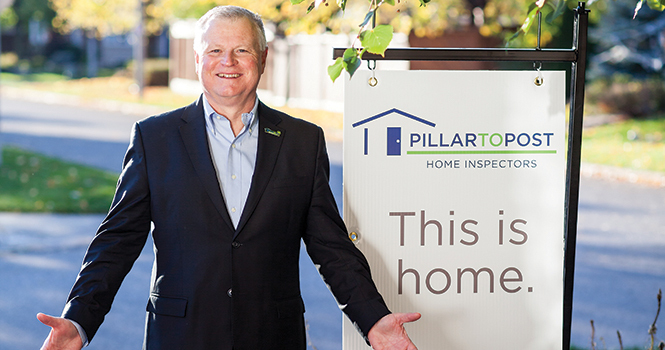 The largest home inspection company in North America—a title held since 1999—Pillar To Post currently has over 550 offices in 49 states, as well as nine provinces in Canada. Tracking toward a goal of 1,000 offices by 2020, the team at Pillar To Post is steadfast in its commitment to delivering leadership and drive into the real estate industry. “While home inspections have been part of the real estate process for 35 years, today they’re integral to the transaction of residential real estate,” says Steward, who goes on to explain that the home inspection industry has come a long way since its inception. “What began as an industry made up primarily of retired homebuilders, the home inspection industry has evolved into a more organized element of the real estate industry today,” adds Steward. And Pillar To Post has been at the forefront every step of the way. The first to establish a curriculum for selecting and training franchisees, create a home inspection protocol/report and computerize the report and include color photos within it, Pillar To Post was also ahead of the game when it came to offering inspection packages to serve the unique needs of buyers across the country. For Pillar To Post’s Vice President of Marketing and Customer Engagement Ken Blackburn, there’s a specific reason behind every company’s decision to be in business. And for Pillar To Post, changing lives is the name of the game. “Everything we do as a business is focused on helping the agent deliver an exceptional experience to their clients,” says Blackburn, positioning Pillar To Post as a key and trusted piece of the agent team. Blackburn points to four key parts of the company’s value proposition that enable Pillar To Post to deliver a great brand experience to buyers and sellers via real estate professionals, beginning with the on-site production of an inspection report immediately following the inspection. Not only does walking the client through the report then and there allow for questions to be answered, it also lays the foundation for providing a level of confidence that’s instrumental in moving the transaction forward. “Delivering reports on-site may seem old-fashioned, but there’s incredible technology that goes into it, all of which is used to fulfill the needs of both the real estate professional and the consumer,” says Steward, who notes that clients are encouraged to be present during the inspection. Blackburn also points to the company’s extensive continuing education program for agents as a key piece toward ensuring a great experience from beginning to end. With 34 different topics available that touch on everything from home renovations and repairs to remodeling and even radon gas and wet basements, the training provided through Pillar To Post goes a long way toward adding to the agent’s perceived value to the client. The company recently launched a learning management platform that allows Pillar To Post to continue to focus on ongoing education among their franchisees and inspectors. “With the ultimate goal of expanding the platform to be used among real estate professionals, agents can quickly and efficiently get the information they need, rather than wait for a Pillar To Post franchisee to come to the office for a live training session,” says Steward. Last but not least, the company has made scheduling home inspections simple. “No matter how an agent wants to connect with us—whether it’s via phone, email, online or smartphone app—we have them covered,” says Blackburn, which is important to today’s agents, as it positions them as both professional and in control when working with buyers and sellers. Value proposition aside, Steward points to Pillar To Post’s customer focus as one difference-maker that continues to drive the company’s success year after year. “We know that what we do affects people’s lives. If we don’t deeply understand and engage with the emotions involved in the process of buying a home, we’re not being a good professional advisor,” says Steward. Performing both pre-purchase and pre-listing inspections, the team at Pillar To Post is dedicated to providing highly valuable information to each party involved in a transaction, a feat that can only be accomplished by understanding the unique needs of real estate professionals, buyers and sellers. “On the industry side, we’re deeply engaged through research and industry involvement so that we can get the necessary feedback in order to focus on and serve the needs of real estate professionals today and into the future,” says Steward. The same can be said for the consumer side of the equation, where consumer-driven research is used to develop services and experiences to fulfill the needs in the journey of buyers and sellers. “The better we understand what’s driving a client’s experience, the better we can put the right services and experience together,” adds Steward, who goes on to explain that being able to effectively communicate with those they serve is a key piece of the puzzle that can’t be overlooked. Being in the information business, everyone at Pillar To Post is committed to keeping the lines of communication open among buyers, sellers and their real estate advisors so they can make informed decisions and have peace of mind with the decision they ultimately make. “Sense of care is so important to us—whether we’re interacting with the buyer, seller or their real estate advisor—so we have to be there with empathy and passion for the situation in order to deliver an experience that’s second to none,” says Steward. With a customer-focused approach to everything they do, having the right people in place across the board is crucial. Lorri Ratliff, a Pillar To Post franchisee in Southwestern Washington, is one such partner. “Being part of the Pillar To Post franchise system allows us to really focus on the home inspection experience with our clients and REALTORS®. The franchise system provides an excellent core structure for business owners (franchisees), allowing us to build and grow our marketshare,” says Ratliff, who can’t say enough about the ways in which Pillar To Post’s brand experience differentiates them from the rest of the pack. “Pillar To Post fosters, through their systems and support structure, a methodology for us to stand out as the best home inspection company in North America. Our clients love the variety of services we offer and the fact that we’re easy to do business with,” adds Ratliff. With a true focus on those delivering the service day-in-and-day-out, the future is looking bright for Pillar To Post as the company prepares to raise the bar even higher. One thing that won’t change? Pillar To Post’s focus on technology, and its role as the core in everything they’re doing today—and well into the future. To that end, the company has made a massive investment in technology in order to plug in more completely with the real estate process. In fact, Pillar To Post recently made a change to the technology platform they use to conduct home inspections, allowing for heads-up inspecting through the use of iPads. Pillar To Post is also looking forward to increasing their use of data when it comes to looking at the evolution of closings and transaction management software. Indeed, one such professional, Executive Vice President of RE/MAX, LLC, Mike Ryan seems to agree.